Rock of Ages Landscapes and Pools has been providing custom pool contractor and consultant services for rock swimming pools and landscapes throughout the United States. They have over 15 years of experience designing, installing, and provide pool builders adv ice on installing custom swimming pools, rock landscapes, pool waterfalls, and slides. 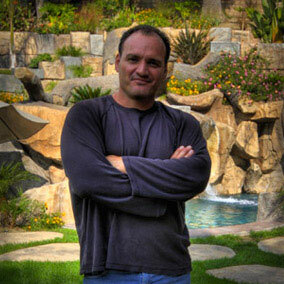 Eric Ray is a custom pool contractor and consultant and has built custom rock pools in Orange County, Los Angeles County, Riverside, San Bernardino, and all throughout Southern California. His main office is in Corona where he dreams up his backyard pool creations. Contact or call 714-390-2534 to speak with Eric of Rock of Ages Landscapes and Pools for a free consultation and find out how you can add a new highly profitable service, prevent mistakes many others have made, or get started building rock swimming pools. Rock of Ages Landscapes and Pools.